Export and import PDF bookmark data using PDFtk Server. This bookmark data can be easily parsed or generated. Create PDF photo albums that behave just like books on your Nook or Kindle ebook reader with a little help from ImageMagick and PDFtk Server. Our mission is to make PDF easier to use. 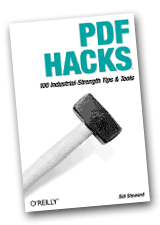 PDF Labs is operated by Sid Steward, author of PDF Hacks (O’Reilly) and the popular PDF Toolkit. For ten years, power users have relied on PDFtk for server-side processing of PDF documents. Our command-line PDFtk has been — and always will be — free (as in freedom) software. Today we also offer a convenient graphical application: PDFtk Pro. Your purchase of PDFtk Pro will help fund the continued development of our GPL PDFtk.